So the countdown to Christmas begins! The question is have you been naughty or nice this year? I for one can happily say I have been nice…in fact practically angelic and I truly deserve my Christmas gift…and by gift I mean Mr X! Yes the rumours are true…settle down…we are still dating since our first hilarious date at the Clocked Event at The Little Yellow Door in Notting Hill! Now I don’t want to jinx it, but everything appears to be going rather perfectly, we really do (without sounding cringe worthy) match…and it’s lovely! Still looking for that special someone or an idea on where to take a date? Well look no further next week, on the 16th December; Clocked will be hosting their Christmas party to celebrate winning the Best New Dating App Award at Boujis in South Kensington. So lets deck the halls and be merry, and I’ll see you there! Happy Holidays my Clocked Community! Is it just me or do the days, weeks, months drag when it comes to Autumn/Winter? I guess that’s why people always say winter is “dating season”… why is that? So you’re not alone on the cold winter nights? So you can happily consume as much food as possible and know they are not allowed to judge you, so you get extra presents at Christmas?? I’ve had a good think about this, and I truly believe people want a “winter boyfriend/girlfriend” not for the sake of it and my reasons above…but because…well…it really is the most wonderful time of the year! There’s something about Christmas in London that I can’t get enough of – the lights, the fashion, the terrible carols they play in Boots, the overflow of Christmas events and markets, and the greatest feeling of love! Why wouldn’t you want to share that with someone? I think that’s what I love about the Clocked app, it finds you matches based on your goals and compatibility. So lets remember this year Londoners…. a relationship is not just for Christmas…its for life! And before you ask…yes me and Mr X are still dating (Ah! ), we’re off to the Shoreditch German Christmas market this weekend…I’ll keep you posted. Clocked warmly invites you to our Cocktail Soiree at Mahiki. 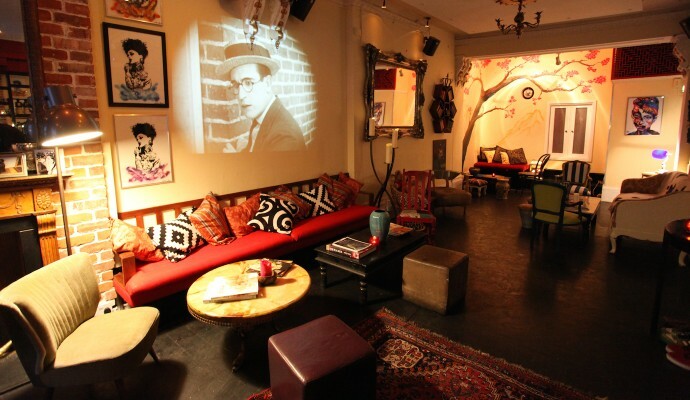 Mahiki is one of London’s most stylish clubs, a favourite for London’s rich and famous. The tropically themed venue flaunts bamboo and serves luscious cocktails that can only be found in the deep depths of equatorial rainforests. Door’s open at 6.00pm. Complimentary Cocktails for all arrivals before 7.30pm. Special value cocktail menu from Mahiki extended to 10pm for our guests. Music: Live music from David Stewart and other special guests (to be announced closer to the time). RSVP: to team@clocked.co for entry. For the second time Clocked is delighted to announce that we are hosting another event at the Little Yellow Door! What a great excuse to get a bunch of friends together and meet new people. No doubt it will be a night to remember! Let us know on the event if you want a reservation or drop us a Whatsapp on 07801267854 or email: team@clocked.co to book your spot. What to expect: A relaxed dinner that shares the vibrant atmosphere of a house party. A warm and unique experience. A shabby but chic venue. A meeting with your future romance?